Stacy Chamberlain, Executive Director of Oregon AFSCME Council 75, said, “The Oregon labor movement is growing and we know that the working people of our state will continue to stay together to protect middle-class jobs with good benefits and wages.” Chamberlain pointed out that there have been several successful organizing efforts over the past several months, from faculty at Oregon State University and Oregon Tech, to Burgerville workers, to Volunteers of America. Based on history in Oregon, the Supreme Court ruling is not expected to reduce Oregon union members’ belief in the importance of uniting for more voice in the workplace. 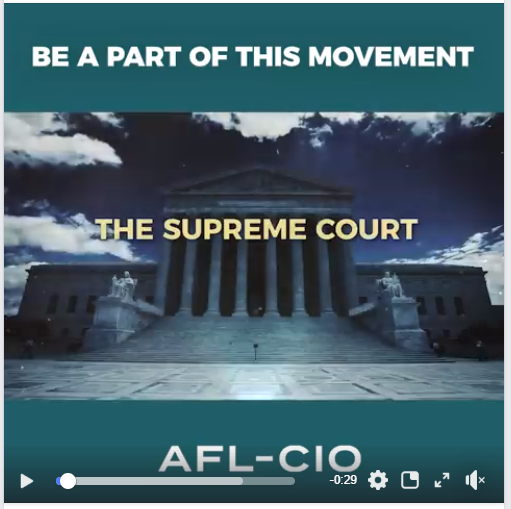 “While the U.S. Supreme Court delivered a long-expected decision in the Janus case that was backed by anti-worker forces, Oregon union members remain dedicated to sticking together, uniting more working people in unions and working with our state’s political leaders to create more good, union jobs,” according to Tom Chamberlain, president of the Oregon AFL-CIO. Join us to stand together in solidarity and to fight back for our unions and our communities. 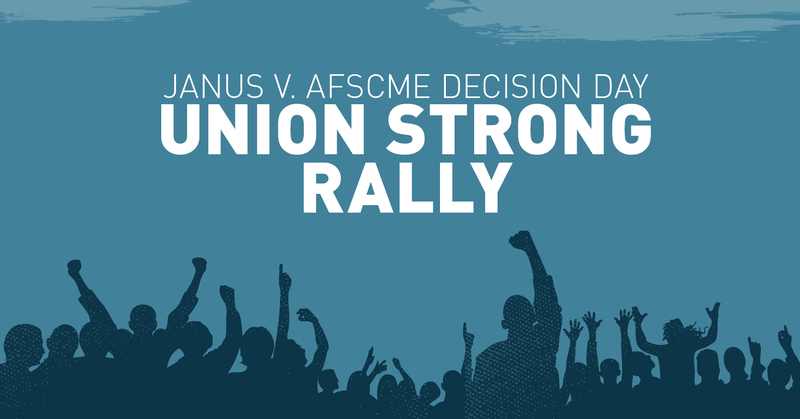 Wear your union t-shirt, bring your banner, and tell your friends, family and coworkers! Good News from Oregon State University! 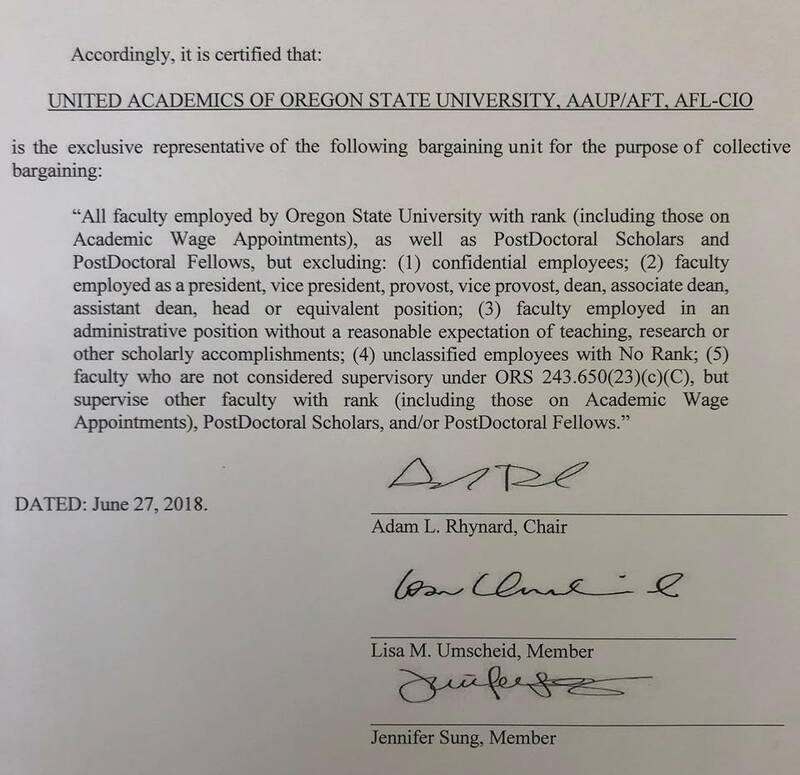 We’re proud to share some good news from the organizing front, the United Academics of Oregon State University is officially certified! Make sure to ‘like’ their page on Facebook to learn the latest and to support these workers in the fight to stand together. A Rally to tell PeaceHealth: "Don't outsource our docs!" 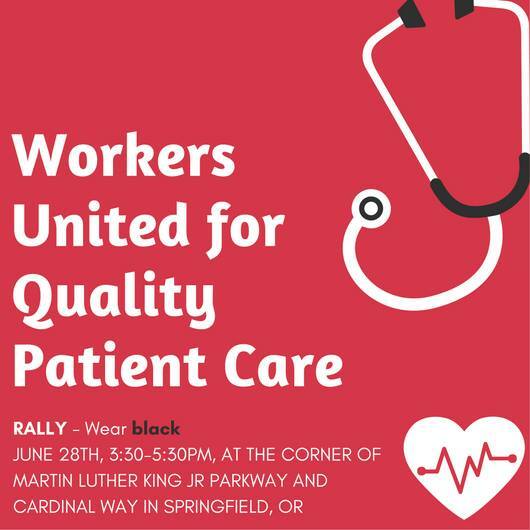 Join us at the corner of Martin Luther King Jr. Parkway and Cardinal Way in Springfield, OR for a rally outside the entrance of Riverbend Medical Center. The Hospitalists Union (AFT Local 6552) made history by joining together as a union in 2015 at PeaceHealth Sacred Heart. By unionizing, these doctors were able to take a stand for safe staffing quality patient care, and improved working conditions. Their commitment to the community is under attack by their employer. PeaceHealth wants to subcontract these doctors in a move to bust their union - a decision we must reject. We need to take a stand of support for these hospitalists - who provide care for our families, friends, and neighbors - by telling PeaceHealth: WE DO NOT WANT THEIR JOBS CONTRACTED OUT. Note to PeaceHealth employees interested in attending – this is not a work stoppage or slow-down. You can attend this rally before or after your shift or on a day off. Multnomah County’s Citizen’s Input Committee (CIC) has operated successfully for over three decades in a collaborative manner, bringing together a wide range of perspectives on issues facing the County and its residents. Since its founding, the CIC has operated in compliance with the County Charter and County Codes. Recent changes to the CIC functions were imposed in violation of the Charter mandate for the CIC. These changes could remove much of the autonomy which has allowed the CIC to operate as a watchdog for the people, outside the direct control of other entities. These recent developments have caused divisions within the members of the CIC and undermined the Committee. The County has failed to support the CIC through its “re-organizing process,” which has created unnecessary strife among its members. The County Commission is now considering whether to step outside the Charter and dissolve the current membership of the CIC, interfering with the very nature of the CIC as an autonomous resource for public engagement. Please support the Citizen Involvement Committee and public engagement this Thursday, June 28 from 9:00 – 11:30am at the Multnomah County Commission Meeting, 502 SE Hawthorne Street, Room 100, in Portland. Support on-going mediation for the members of the CIC, without interference in conflict with the County Charter that governs the Committee. For further information please contact Beth Cooke at beth@innovaresnw.com or (503) 720-3574.